At an antiquarian book show last weekend I picked up a copy of Gancel’s Encyclopedia of Modern Cooking originally published in French in 1918, with an English version in 1920. 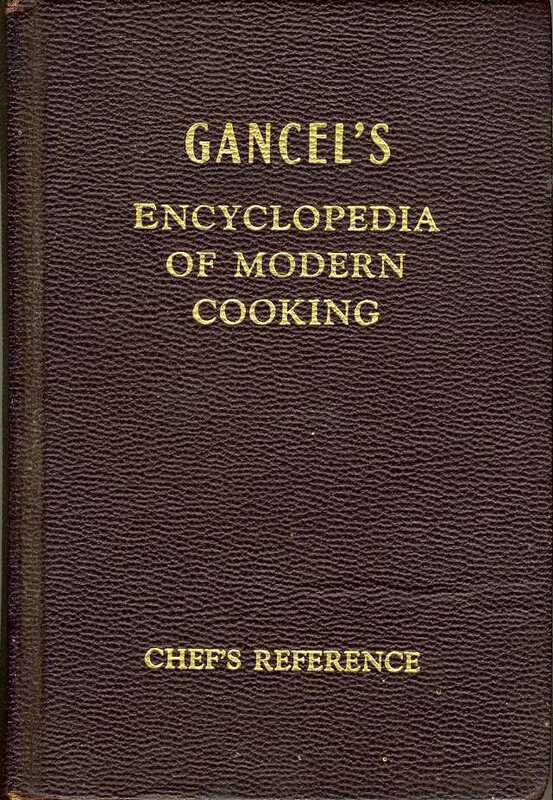 Gancel’s Encyclopedia was an enlarged and enhanced version of his 1909 Ready Reference of Menu Terms which he compiled to assist waiters in explaining to diners the bewildering number of dishes, mostly in French, found on menus of the best restaurants of that time. 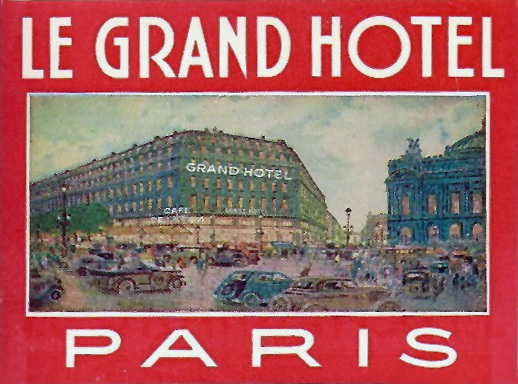 Joseph E. Gancel was a Frenchman who had a long career working in hotels and restaurants in the United States, France, and Belgium, as well as clubs and organizations such as the Brazilian Embassy in Brussels and the Press Club in Paris. In 1874, at age 12, Joseph began his culinary apprenticeship in Rennes, France. In the 1880s he worked in the kitchens of European hotels such as Paris’s Grand Hotel and restaurants such as the Café de la Paix and the Moulin Rouge in Paris and the Antwerp branch of the Paris oyster house Rocher de Cancale. 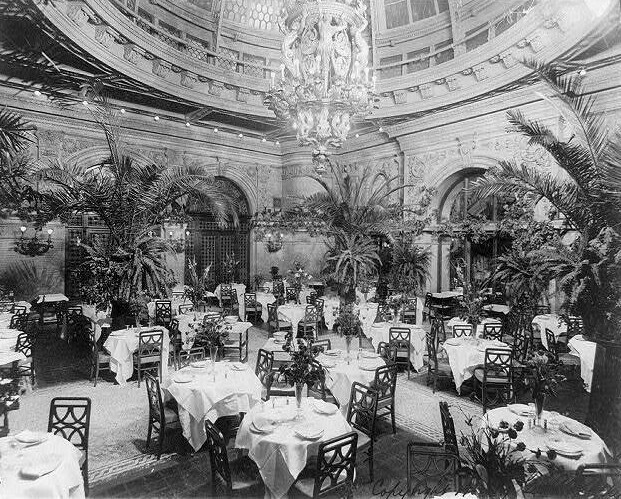 In 1892 he immigrated to the United States with his wife and five children, finding work at the Waldorf-Astoria [pictured], the Plaza, Sherry’s, and others. He worked at many places; I’ve counted 21 and I’m sure the total is greater. When he published his 1920 edition of the Encyclopedia, he was about 58 years old and living in San Francisco where he was a member of Cooks’ Union Local 44. The self-published book, mailed from the author’s lodging house, cost $2.50. I hope he made some money from the book – evidently he had not become rich as a chef. 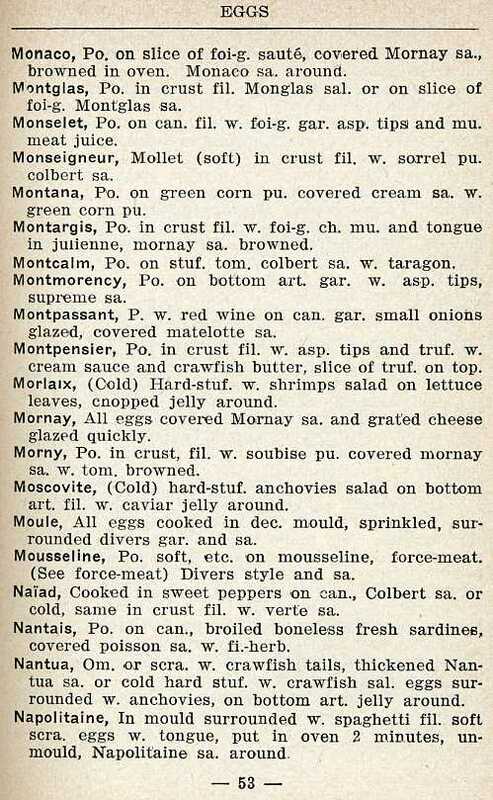 Just how confusing menus could be is indicated by the number of egg dishes included in his 1920 book: 477! To keep the book pocket-size he had to do a lot of abbreviation, leading H. L. Mencken to say, rather wryly, “His terse, epigrammatic style touches the heart.” Readers trying to make sense of the above sample page might like to know that . . . I have a 1920 published book. Says it is the seventh edition (revised and augmented!). Interesting reading. Have had it for years and always enjoy rereading it. Thanks for the information. I own several copies of this book as the man is my great grandfather. However, I know little about him. Thanks for the interesting article. I received this very book as a Christmas present from my wife. I found it very interesting, although there are many terms that I feel are terribly out of date and I have to look up.